Dry Needling involves the insertion of a thin filament needle to stimulate the healing process of soft tissues (muscle “trigger points”, fascia, tendons and ligaments, etc.). The result of dry needling is pain relief and restoration of healthy physiology. A “trigger point” is a hyperirritable point in a muscle that is associated with a hypersensitive palpable nodule, or “knot.” This area becomes painful at the site and can also “radiate” in predictable patterns. A healthy muscle feels very little discomfort with insertion of this needle. However if the muscle is sensitive and shortened or has active trigger points within it, the subject will feel a sensation like a muscle cramp (the “twitch” response). 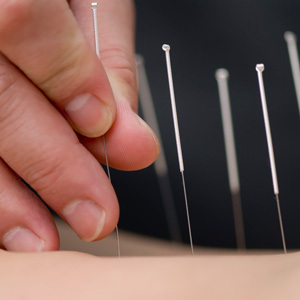 Is Dry Needling covered by my health insurance? Make an appointment with us today to see if dry needling is a therapy that might help you.